Everyone in your Wild Apricot database is a contact. A contact can be a member, an event attendee, a donor, a newsletter subscriber, or any combination of these roles. Contacts can be added automatically through your website, added manually by an administrator, or imported in bulk. Information about each contact is stored in a separate record, with each record storing different chunks of information in fields (e.g. first name, last name, email address). You can customize your contact database – and your forms – by adding, modifying, reordering, and deleting database fields. In addition to their contact record, each contact can also have a membership record, and one or more event registration records or donation records. Wild Apricot database fields are divided into two classes: common fields – fields that apply to all records (e.g. first name, last name, email address) – and specialized fields that only apply to membership applications, event registrations, or donations. Each record is a combination of common fields and fields specific to that type of record. For example, a membership record will consist of membership fields and common fields, while a donation record will consist of donation fields and common fields. The forms that appear to the user – and are used to create records – also combine both types of fields. A membership form, for example, will display both common fields and membership fields. To customize a form, you can add or remove fields, either common fields or fields specific to the form. 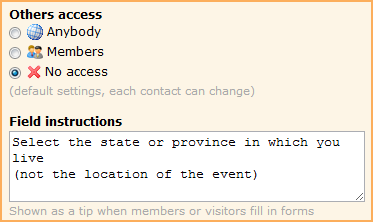 The values entered in common fields on membership application forms will update the corresponding fields in the applicant's contact record (if one already exists), but the values entered in common fields on event registration forms are stored separately from the contact record within event registration records. Similarly, the values entered in common fields on donation forms are stored separately within donation records. You can add any number of common fields or other database fields. You can set membership fields to apply only to members at specific membership levels. 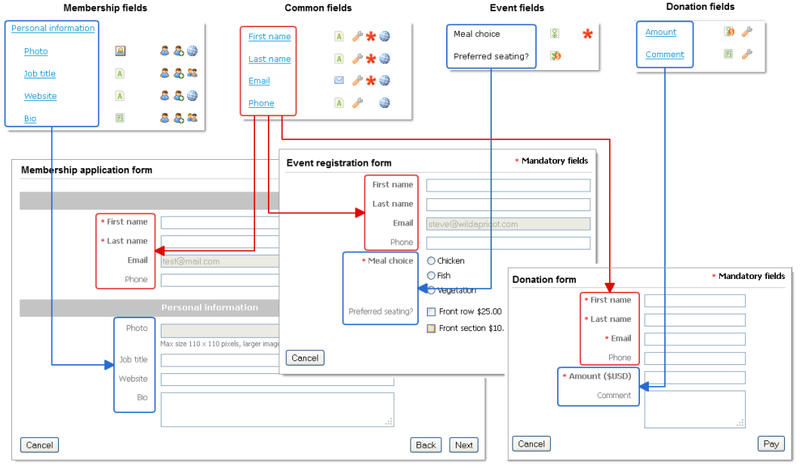 Since common fields are automatically added to all forms (membership, event, and donation forms), fields that apply to all forms should be created as common fields. Registration form tab from the event's details page. 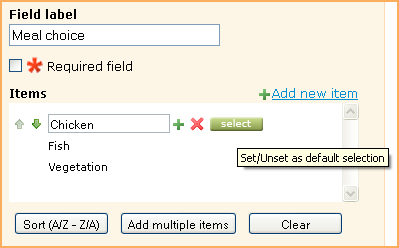 From the screen that appears, you can add, modify, reorder, and delete fields. Any changes you make will be immediately reflected on screen but will not be applied elsewhere until you click Save all changes. Once your changes are saved, they will be reflected on applicable online forms, contact records, and directories. To add a new field from the Customize fields screen, click Add new field. For new fields, you can set the field type and change field settings (see below). You can also add contact and membership fields via importing. For more information, see Importing members and other contacts. To modify an existing field, click it within the list. With the field selected, you can change various field settings but not the field type. To delete a field, click it within the list, then click the delete link on the right. You cannot delete system fields (Member ID, First name, Last name, Organization, Email, and Phone). You can, however, hide a system field (other than Member ID or Email) by setting it to admin only access. After you delete a field, it appears crossed out in the field list until you save your changes. While the field appears crossed out, you can restore it by clicking the restore link. Deleting a field will automatically lose all data stored in that field for all contacts. To change the order in which fields appear, you can drag and drop fields within the list, or you can click the green up and down arrows beside a field. You can only choose the field type when you create a new field. You cannot change the type for an existing field. Simple text field, used for short entries (up to 200 characters). Used for longer text entries (up to 3,000 characters). A set of checkboxes (up to 100 characters per item). For instructions on adding choices, see Adding choices to multi-option fields below. A set of mutually exclusive choices (up to 100 characters per item), arranged like buttons on a car radio. For instructions on adding choices, see Adding choices to multi-option fields below. (Event and membership fields only) Allows you to provide optional extras (displayed as checkboxes) at an additional cost. For more information, see Extra membership costs and Extra event registration costs. (Event and membership fields only) Allows you to display a set of mutually exclusive options at an additional cost. For more information, see Extra membership costs and Extra event registration costs. (Event and membership fields only ) Provides the ability to order multiple items, or to charge an additional fee proportional to a value entered by the applicant or registrant. For organizational members, you might want to charge an extra fee based on their revenue, number of staff, or grants they've received. 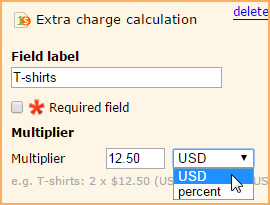 For more information, see Extra charge calculation fields (below). A set of mutually exclusive choices, arranged in a drop-down list. For instructions on adding choices, see Adding choices to multi-option fields below. Allows membership applicants and event registrants to upload files, and/or administrators to upload files to their accounts. The supported document types are: TXT, PDF, DOC, DOCX, XLS, XLSX, PTT, PPTX, ZIP, CSV. The supported image types are: JPG, JPEG, GIF, PNG, TIF, TIFF. File attachment fields cannot be displayed within a member directory, or included in emails using a macro. For more information on using file attachment fields, click here. (Common and membership fields only) Used to display a photo, company logo, or online avatar. This field supports the following file types: .JPG, .GIF, .PNG and .TIF. For more information, see Adding member or contact pictures. Displays a calendar control that can be used to select a date. Used to group and separate fields. The field label you choose will appear as a section heading, but only if there are fields below it. To change the field type for an existing field, export all contacts to an Excel file, delete the field, re-create it as a new field type, then re-import the saved Excel file. You can change field settings for new and existing fields. Field settings appear when you click a field within the list. The name used to identify the field, or the label for the section divider. The field label must be unique among your database fields, and is not case sensitive. Controls whether the field has to be filled out before the form can be submitted. For all self-service online forms, (member application, email subscription, donation, and event registration), the Email field is always a required field. Identifies this as an internal field that can only be seen or edited by an administrator. For more information, see Internal use fields (below). Choose the options to be displayed. 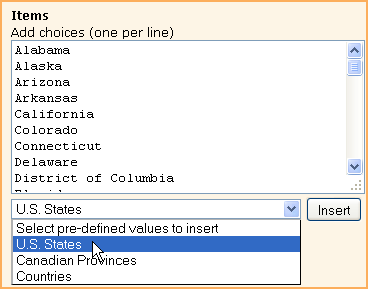 For more information, see Adding choices to multi-option fields below. Indicate whether to include in new membership application forms. If enabled, you can also control whether the cost should be prorated over a partial period of time. Indicate whether to include in membership renewal form. If enabled, you can also control whether members can change their original selection when renewing. Members can edit the field by logging into their account and editing their private member profiles. Members can only edit the field when filling in the application form. Members can view the contents of the field but only an administrator can change it. Administrator-only field that is hidden from members and the public. For more information, see Internal use fields (below). Controls whether other members or public visitors can view the contents of this field. The choice you make is used as the default privacy setting that appears for the field on the Member privacy settings screen, and on the Privacy tab of individual contact records and private member profiles. From the Privacy tab on their member profiles, members (and logged in contacts) can change the default privacy settings for individual fields, unless you have locked them down on the Member privacy settings screen. From the Member privacy settings screen, you can change the default privacy settings for individual fields and optionally, force those changes onto individual contact records. Setting this to No access will not stop members from editing their own values for this field, and will not stop the field from appearing in the membership application form. Determines whether the field applies to all membership levels or is restricted to one or more specific membership levels. For more information, see Restricting fields by membership levels (below). Allows you to control how the donor indicates the donation amount. For more information, see Donation forms. Determines the value to be applied to the visitor's entered value, and whether the multiplier is the unit cost or a percentage. For more information, see Using the extra charge calculation field (below). For extra charge calculation fields where the multiplier is the unit cost, determines the minimum and maximum number of items that can be ordered. For extra charge calculation fields where the multiplier is a percentage, determines the minimum and maximum resulting charge. For more information, see Using the extra charge calculation field (below). Instructions explaining how to use this field. For information on controlling the appearance of field instructions, see Adding field instructions (below). If you want to make a field required or mandatory, so that the field has to be filled out before the form can be submitted, click the Required field checkbox within the field settings. For all self-service online forms, (member application, email subscription, donation, and event registration), the Email field is always required. When you create a field using the Multiple choice, Radio buttons, or Dropdown type, you add items that represent choices for the user. Using the Items text box, you add one item per line, up to 100 characters per item. (Press Enter on your keyboard to move to the next line). You can also paste text from another program to speed up text entry. To use one of these lists, select the one you want to use from the list box labeled Select pre-defined value to insert then click Insert. Once you are finished populating your list, click Done to save your list. You still need to click the Save all changes button at the top of the screen to finalize all the changes to this and any other fields you might have added or modified. After you click Done, new options appear to allow you to manage your list. Sorts the list by alphabetical order. The first click will sort it from A to Z. A second click will sort it from Z to A. Opens a window with a text box where you can multiple items one line at a time. Existing items will not appear in the list. New items will be added to the bottom of the list. You can move them individually or use the Sort button to re-sort the list. Moves the item up or down within the list. Adds a new item below the selected one. You can also add a new item to the bottom of the list by clicking on the Add new item link at the top of the item list. Select/deselects the item as the default choice. Radio buttons and drop-downs can only have one default selection, while checkboxes can have multiple items selected by default. You can reorder items within multi-option fields on an event registration form without affecting choices already entered and stored for event registrants. If you rename an item, existing choices will appear under the new name. Deleting an item, however, will remove that selection for all registrants who chose it. The extra charge calculation field is similar to the multiple choice with extra charge field and the radio buttons with extra charge field, but allows you to specify a unit cost for multiple orders, or apply a percentage to charge dynamic fees based on some factor. For example, you might want to provide an option to purchase any number of t-shirts, or charge a variable membership or event fee based on organization size or income. The unit cost or percentage is applied to the value entered by the applicant or registrant in the membership application form or event registration form. ...and choose the currency if you want to specify a unit cost, or percent if you want to apply a percentage to the entered value. If you choose the currency so you can specify a unit cost, you can also specify the minimum and maximum number of items you visitor can order. Values below the minimum or above the maximum will not be accepted. Adding it to a membership form, for example, allows you to require applicants to acknowledge certain policies before applying for membership. For example, you might enter a website address such as www.example.com/terms or a file location like /resources/terms.pdf. Make sure the link address you enter is a publicly accessible location. You may want to track information about your contacts without sharing the information with them or anyone else. To do so, you can set a field as internal use only. You want to track whether people attended the events they have registered for, so you create a field called Event attended and mark their attendance in the field on their Event registration details screen. You want to recruit more female members, so you add a field called Gender to track this information. You can make any common or membership field you create an internal use field by setting access to For administrator access only (for common fields) or Internal use only (for membership fields). Administrator-only fields are displayed under Internal use on the Contact details screen. You can click the Edit button to modify internal use field values for a contact. Any time a contact fills out an application, records a donation, or registers for an event, the internal use fields and their values for that contact are copied to the registration, application, or donation record. You can restrict membership fields to specific membership levels. Select the field within the list of membership fields. Under Use in, click Selected levels. Check each of the membership levels you want this field to apply to. A lock icon will appear to indicate that the field is restricted to particular membership levels. To quickly review which fields belong to what level you can filter the membership fields by membership level. You can display all fields, fields for a particular membership levels, or fields common to all membership levels. You can add instructions to individual form fields explaining how to use them. 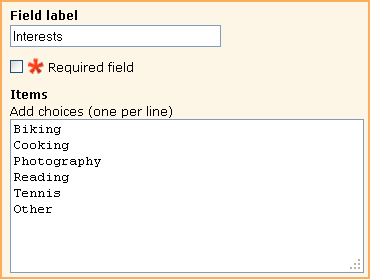 On some forms, such as application forms, certain fields can require more explanation than a field label can provide. The instructions will only appear when the form is being filled out. From the Colors and styles screen, you can change the overall appearance of field instructions – typeface, size, color, etc. – but you cannot apply local formatting (such as bolding individual words). Where can I add field instructions? 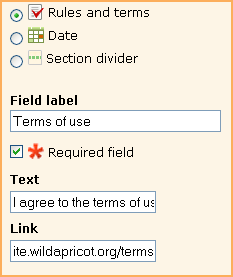 You can add field-level instructions to fields appearing on online forms provided by Wild Apricot. You cannot add field-level instructions to custom forms. You can add instructions to both system and non-system fields, except for the User ID system field. How do I add field instructions? When adding or modifying a field, enter the instructional text in the Field instructions box towards the bottom. You can enter up to 250 characters per field, and use the Enter key to add line breaks. You cannot use HTML code or any other kind of local formatting. 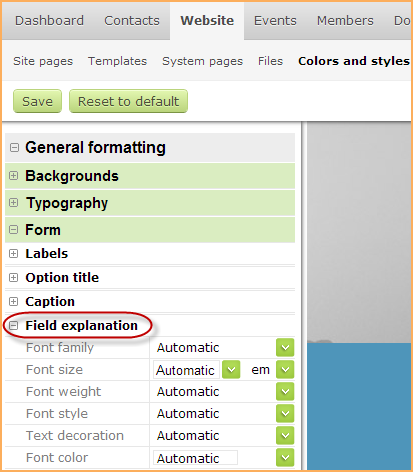 On the Colors and styles screen, you can change the appearance of field instructions on your site. You can control the typeface, text size, color, and other attributes. You cannot change the appearance of individual instructions or selected words within a set of instructions. Under the Website menu, click Colors and styles. Expand the General formatting section. Expand the Field explanation section. Typeface used to display the text. The attributes you specify will be applied to all field instructions on your site.